The Fractious Background of ‘left Populist’ Jean-Luc Mélenchon, Guest of ‘The World Transformed” at the Labour Conference. Something Fishy about Mélenchon’s ‘left-Populism’? The leader of La France insoumise will soon be in Liverpool. The World Transformed will be welcoming Jean-Luc Mélenchon to speak at its Labour conference fringe. The French politician who inspired the European left with his radical campaign for the presidency in 2017 won more than seven million votes. Since then, despite only commanding 17 MPs in the National Assembly, Mélenchon has emerged as the main resistance to the neoliberal ‘Jupiterian’ presidency of Emmanuel Macron. The socialist veteran will appear alongside Labour shadow cabinet member Jon Trickett in one of the headline acts of our four-day festival of politics, art and music that has become a mainstay of party conference. ..the real reason for Mélenchon’s invitation to TWT is not because he is Corbyn mark 2. No, it is for the same reason that TWT is happening in the first place: as part of a democratic socialist project to shift power towards the people. The fundamental truth about the two men’s successes is that it’s not about them. It’s about what they, and TWT, represent: the left taking hold of the future. Mélenchon ‘commands’ 15 MPs, there are two allies (Clémentine Autainand Caroline Fiat) from the alliance of small left groups known as Ensemble who form the Parliamentary Group of 17. The Ensemble site has published material, in the past, highly critical of Mélenchon. In 2016 they put up a text by Samy Joshua arguing that his strategy of ”federating the people’ dropped the working class for left populism. « L’ère du peuple » et « l’adieu au prolétariat » ? This was encapsulated by their 2017 manifestos. It was Corbyn’s left-wing programme of nationalisation, abolishing tuition fees and improving workers’ rights that precipitated his astonishing rise in the polls. Mélenchon’s similarly dizzying rise stemmed from the bold manifesto, L’Avenir en Commun (A Shared Future), which he put forward with his party La France Insoumise (FI). It was the promise of a Sixth Republic, based on the principles of justice and democracy, which saw young and old flock to Mélenchon’s campaign. Likewise, Corbyn promised a constitutional convention as part of his quiet political revolution. Both seek to distribute power to the people. Shifts in political power will, however, achieve little without an attendant transfer in economic power. The resurgent left is based above all on one thing: the return of class to politics. As Corbyn put it in a speech last month, Labour is back as the party of the working class. Mélenchon was at the heart of recent protests against Macron’s zombie neoliberal ‘reforms’ targeting the once-powerful French public sector (particularly rail workers). Both would repeal restrictive trade union laws, move to protect people from precarity and rebuild national industry following the ravages of neoliberalism. This statement lacks any recognition of a long political past, not only before the Ère du people replaced class as the defining context of Mélenchonian ideology. Jean-Luc Mélenchon’s political career began in the orthodox Trotskyist current in France known as ‘Lambertist’ after the Leader of a long-standing variety of groups, Pierre Lambert (real name, Pierre Boussel). As a student he joined, after May 68, the Lambertists, one the most rigid and authoritarian groups on the French left, the ‘Organisation communiste internationaliste (OCI). The future Presidential candidate was head of the local antennae in Besançon, between 1974 and 1976. Mélenchon left the PS in 2008, wishing, he stated, to draw clear lines with the right of the party and to have complete freedom to pursue his own left-wing course. Forming the micro-party, the Parti de Gauche (essentially a public version of a Parti Socialiste ‘club’, ambitiously named after the German Die Linke)) in 2008, Mélenchon entered in a long series of alliances, with forces such as the Parti Communiste Français, and smaller left groups. These culminated in the bloc, the Front de Gauche, which was marked by conflicts, over issues such the composition of electoral lists and his own version of republican laïcité. With the creation of La France insoumise (LFI) in 2016, he has entered into a “war of manoeuvre” for hegemony over the French left. Some have compared this with the old Communist Party’s wish to impose itself over the whole left, and its tactic as to keep its supporters preoccupied by frenetic activism. LFI is not a Party but a “movement of individual citizens those who recognise themselves in the line of action offered by JLM “un mouvement de citoyens individuels qui se reconnaissent dans la démarche de Jean-Luc Mélenchon “. That is, is defined by allegiance to an individual. LFI has no proper internal democracy at all. Conferences, such as they are, a rallies in which up to 60% of the ‘delegates’ are chosen by lot from the lists of (on-Line) members who have expressed an interests. The rest are made up from those chosen by what has been called “la petite caste” around the Leader (A La France insoumise, la démocratie interne fait débat). It’s this caste who take all the decisions. There are no internal tendencies; on-line voting is on a limited agenda set by the central leadership. LFI’s best known strategic objective is to “federate the people” against the oligarchy dominating French politics. This, a broad enough aim, “includes” the workers’ movement (that is skipping over the organised union federations, the CGT, CFD, FO, FSU and SUD), just as it does ‘social movements’, like the late Nuit Debout that occupied French squares in 2016 (freely translated as Woke Nights). Critics say that the “people” figures in LFI’s plans as actors to follow the LFI script for the Sixth Republic. More abstractly, their disparate discourses are ‘articulated’ (voiced and linked together), in the words of the theorist of Left Populism Chantal Mouffe, to create a new, potentially hegemonic Collective Will. It is true that those who enjoy inspiring speeches, lacked with poems, from Victor Hugo to Apollinaire, have much to hear from Jean Luc. But the nationalist overtones of books like the Le Hareng de Bismarck, (2015 above) which rails against the “Le poison allemand” (German poison) imposed on Europe, l’opium des riches”, un monstre born on the other side of the Rhine, are hard to ignore. 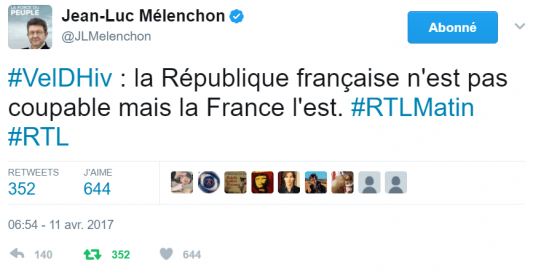 Mélenchon defines himself as socialiste républicain. In French terms this means a belief that the Republic is the prime vehicle for socialism. The Sixth republic, in the ‘era of the People’, needs radical reform. It is hard to see how any of the political reforms proposed bring the state into the hands of the People, there is little in way of socialising ownership under self-management to start with. As such he puts the Sovereignty of the People/France, at the top of his priorities. The EU must change or we will leave it, was his reaction (some interpreted this as a welcome at the shock) to the Brexit result. On international issues he is anything but an internationalist. His priority again is the national interest, defending the French independent nuclear force outside of NATO. The Leader of LFI has faced accusations of conspiracism (he has been known to claim that Daesh was created by the US) , of complaisance towards Vladimir Putin, and a failure to defend democrats (although he has taken a serious stand in defence of the Kurds) in Syria. He continues to support the Maduro regime in Venezuela. He should not be welcome at the World Transformed, still less a Labour Conference. (1) Covered from his side in Le Choix de l’insoumission, Jean-Luc Mélenchon, Marc Endeweld. 2016. Less complimentary background is given by another former Lambertist, 68, et Après. Les héritages égarés. Benjamin Stora. Stock. 2018. Trump Leaves Brexiteers, from Hard Right to “People’s Brexit’ in Disarray. Stathis Kouvelakis Borderland. New Left Review. 110. March-April. 2018. The EU wants to break our national will — Brexit victory would be like winning the Falklands War. Sir Bernard Jenkin. MP for Harwich. The Current Bun. 14th of July. For the King’s College academic and Greek supporter of La France insoumise (LFI), who claims, as is the custom of such academics, to speak for the “European left”, beyond the reaches of social democracy, the Brexit vote was welcomed by many on that radical fringe. The British left, Kouvelakis said after the UK Referendum result, in the American journal Jacobin, should adapt to the result. Prime amongst our change of strategy should be a ” positive, conquering attitude at the level of the national formation”, that is to the British nation. The task of the left in these Isles is to see (he cites Étienne Balibar, as one does) into the reasons for the Brexit vote, notably recognising that racism is “a displaced form of class struggle” and act henceforth to remedy this. With this consoling thought in mind – no doubt reassuring for the victims of racialist attacks who can come to terms with their injuries by reading Balibar’s debates with Judith Butler in this latest work, Des Universels. Essais et conférences, Éditions Galilée, 2016 – he advocates a new approach. The Nation as a political object for the left is suspect for many reasons, one of which appears in Flaubert’s Le Dictionnaire des idées reçues: “Nation. Réunir ici tous les peuples.” Nation: Unite here all the Peoples. But is would perhaps be more appropriate to cite an old saw of Chantal Mouffe and Ernesto Laclau adopted by some strategists of La France insoumise which Kouvelakis so supports, that ‘federating the people’ requires constructing an “us” against a “them“. It is no doubt the moment to point out that this ‘Other’ , the ‘them’ – a capitalised word that sends many of ‘us’ reaching for our updated version of Flaubert’s work – has been doing a lot of work recently. LFI prefers some nebulous alliance of the “popular classes” against a shifting spectrum of the “elite”. President Trump Calls the European Union a ‘Foe’ of the U.S.
Pro-Trump demonstrators in London on Saturday remain fixated, a little more explicitly than the ‘left behind’ but still salt-of-the earth ‘real’ voters Kouvelakis and his mates are so worried about, on immigration. Sir Bernard Jenkin is not alone in wishing a decisive battle with the EU. Other calls from Brexitering Tories against soft Brexit ‘traitors’ (Remainers in all but name) has an echo in the desperate rantings of the ‘People’s Brexit’ cheerleaders. UK big business and their EU allies are increasingly looking to the Labour Party to deliver them from the chronic, systemic incompetence of the Tory party. And most Labour MPs would love to help. Stuffed shirt lawyer Kier Starmer is signalling like a sailor lost at sea that he’d love to deliver a soft Brexit and is constantly trailing his openness to a second referendum. Chuka Umunna and his allies would love to deliver the double whammy of defeating Corbyn and defeating Brexit. The labour movement’s “red lines” should be clear. To support investment, trade and jobs, we need a Labour government with the freedom outside the EU to implement its left and progressive policies. The problem is that nobody, absolutely nobody, takes the call for this “freedom” from the EU “iron cage” seriously anymore. As for the ‘People’s Brexit’ – what mass moblisation have they to show for their campaign to “take back control”? The US president has simply pointed out the obvious: the UK cannot maintain free trade with the European Union and at the same time strike new trade deals with other countries, such as the US. If the UK commits to follow EU rules and regulations in goods and agricultural products, as it said last week that it wants to do, then it will not be able to sign a new and different trade deal with the US . As Trump put, in his interview with the Sun: “If they do a deal like that, we would be dealing with the European Union instead of dealing with the UK, so it will probably kill the deal.” He half backed away from this yesterday – saying a trade agreement could still be on and backing away from the “ kill the deal” comment. But he was right the first time – if the UK does stay tied to EU rules, there won’t be any point. Justine Greening calls for second Brexit referendum. Justine Greening has called for a second referendum, labelling the prime minister’s Brexit deal a “fudge”. Writing in the Times, the former education secretary described Theresa May’s proposals as “the worst of both worlds”. The final decision should be given back to the people and out of “deadlocked politicians” hands, Ms Greening said. She states there are three options: the PM’s deal, staying in the EU or a clean break from Europe with no deal. Speaking on BBC Radio 4’s Today programme, Ms Greening said the government’s proposals were a “genuine clever attempt at a compromise that could work” but “suits no-one”. But then no doubt trade deals, new referendums, and all the rest probably mean little to readers of Balibar and “constructors of the People” Independent of the EU. The Defeat of the French Left: Chronique d’une Débâcle. 2012 – 2017. Jean-Christophe Cambadélis. Chronique d’une Débâcle. 2012 – 2017. Jean-Christophe Cambadélis. L’Archipel. 2017. How could the French Socialist Party, (Parti Socialiste, PS) fall from the political heavens to the nether depths? Jean-Christophe Cambadélis, was until the 18th of June PS General Secretary of the opens his Chronicle with this question. Cambadélis has no need to dramatise. The political force which broke decades of right-wing rule with the election of François Mitterrand in 1981, helped nudge the previously front-running Communists to second place, and then the sidelines. Until this Spring it has dominated France’s left, culturally and politically, for forty years, running the country for up to twenty of them, and has been in charge of many levels of local and regional administration. Their defection did not stop there. Two Ministers of the newly elected President Philippe Cabinet, Gérard Collomb and Jean-Yves Le Drian, are former leading Socialists. The PS’s Presidential candidate, Benoît Hamon, left the party and created the Mouvement du 1er Juillet with ecological policies and ambitions to create a new “common House” for the left. Supported by a number of regional elected figures he was joined last week by two resigning PS Euro-deputies. Some of the answers lies in the difficulty of the left internationally, where from Latin America to Europe, the “progressives” have not been able to sustain reforming politics in power (Chili is the most recent example), even to mount effective opposition in more than a handful of countries, such as Britain. But the French case is particular. The disaster for “la gauche du gouvernement’, that is a party which has been capable of governing the country, has taken place amongst a wider fragmentation of France’s left. It marks the end, as Cambadélis puts it, of a “cycle” which began with the creation of modern Parti Socialiste at the Congrès d’Epinay in 1971 and the “stratégie d’alliance” of different lefts. (Page 39) We have a “moral” defeat, where elected politicians have come to think not in terms of strategy but of “careers” in which power has become just an end in itself. (“une simple fin en soi.” Page 10) For those who see a silver lining in the result of Jean-Luc Mélenchon, 9.58% and his 17 elected representatives in the Assemblée Nationale, this is of less importance, but Cambadélis gives reasons why the left internationally should not celebrate their presence without reservation. With these opening remarks in mind the present book tries to rise above a settling of accounts (a charge many reviewers have made) to consider the failings of the left, both the camp of and his opponents, with the context of wider issues about the future of the French left. It is both narrative and analysis. The Chronique is also very acute account from somebody with a reputation for a “fine political nose”. The French left is famous for its division between a nominally ‘revolutionary’ radical left-wing and a ‘reformist’ wing. Yet during the period of the Gauche plurielle under Lionel Jospin (1997 – 2001), – which ended in its own splintering – many sections worked together. In this decade, by contrast, the left was divided from the moment François Hollande’s Presidency began in 2012. The forces at that point aligned in the Front de gauche, notably the Parti Communiste français (PCF), and Mélenchon’s ‘club-party’ the Parti de gauche, were unwilling to offer it support. The PS’s own opposition, the ‘Frondeurs’, largely but not exclusively drawn from its left, began to act in earnest in the 2014. They took their criticisms of policy to Parliamentary votes and hampered legislation to the point where direct decrees, in the leadership’s view, forced upon them. Most of their only serious left allies, the Green EELV, left when Manuel Valls became PM in 2014 and the government’s “social liberalism” policies became anathema to the left. But it was Jean-Luc Mélenchon, by founding La France insoumise (LFI) – a would-be mass movement with a large virtual Web membership, who fundamentally divided the left. Whether one has more sympathy for Mélenchon or not, it is certain that he has not been out to accomplish is a new “union of the left”. The theme of “dégagisme”(get out! ), a French version of the ‘anti-caste’ strategy of Podemos and other ‘populists, has run through the wider politics of “federating the people”. LFI demands that the whole ‘rotten’ political establishment be removed. That this includes the entire Parliamentary left beyond les insoumises – loudly in the case of the PS and as near as they can publicly say it about the PCF reflects a belief, which Cambadélis hammers home, that only the Sovereign People, that is, themselves, can restore political virtue through a new, 6th, Republic, a theme taken up by Mélenchon in the modestly titled de La Vertu (2017). 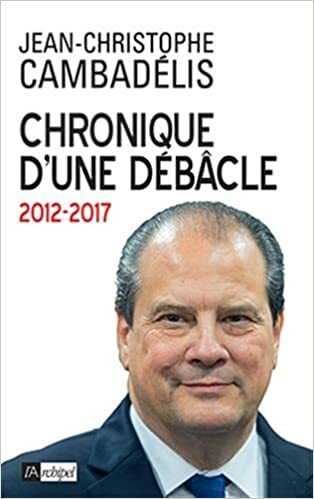 Cambadélis calls Mélenchon the “fils du lambertisme et du mitterandisme” (Page 10) This is a helpful reminder not only of the Leader of LFI’s past in one of the most dogmatic, and patriotic French Trotskyist currents, and his cult of the former French President, but of the author’s own background as a student activist member of Pierre Lambert’s OCI, and 1980s transfer to the PS with the benevolence of the Élysée…. Yet how has this anti-system left grown? Why has the legacy of 5 years of Socialist Party rule been so toxic, even beyond the traditional quarters ready to cry “betrayal”? On the balance sheet of 5 years in office Cambadélis tries to find some glimmers of hope. There was a dignified Presidential reaction to the Islamist slaughters that have soiled Europe and above all France in the last years. He attempted some international initiatives to fight Jihadism in Africa and seek peace elsewhere. His Prime Ministers, Ayrault and Valls, introduced gay marriage, a dialogue on the environment, a faltering reduction in unemployment, better growth rates, and the start of efforts to deal with high rates of national debt. He is less tender towards the proposal to remove French nationality from those accused of terrorism Cambadélis is equally less than sympathetic towards the labour reforms, la Loi El Khomri, largely on the grounds of its unilateral implementation – now pursued by the in-coming Macron. The Chronique claims there was some effort to control Finance on a European level (in banking), and having kept Greece within the Euro (Page 171) There is nothing to support the idea, held to by some English speaking left-wingers, that French domestic policies – that is the failure to confront ‘neoliberalism’, a tax on the hyper-wealthy aside – are either forced upon them by the EU, or that France subordinates its governance to the construction of Europe. None of this adds up to a sustainable case for the successes of Hollande presidency, or the Prime Ministers of Ayrault and Valls. Some welcome reforms, some moves towards economic improvement, contestable international interventions, and, nothing to promote the security and rights of working people, the unemployed – very little reform except in the sense of reshaping, that is weakening existing labour legislation. In short, nothing to shout proudly about from the rooftops. This lack of reforming deeds, democratic socialist egalitarian economic policies, an equivocal stand on civil liberties, symbolise don the permanent state of emergency, are one aspect of the problem, The other is that Hollande’s ‘method’ appears to have boiled down to an inability to left events dominate his action, wrapped in an immense capacity for self-satisfaction at his residence at the Élysée. The smugness that lead the President, during his term of office, to sanction the publication of the interminably lengthy Un Président ne devrait pas dire cela (2016), full of causally wounding comments about his colleagues and the tossed our phrase, “il faut un hara-kiri pour le PS”. stems from this complacency. He engaged in – slatternly – affairs. For those – and they are numerous – uninterested in the details of politics his partner, Valérie Trierweiler’s enraged response in Merci pour ce moment (2014) gave an unpleasant insight into the man. Amongst many flaws he was not unafraid to patronise the working class poor, the “sans dents” (toothless). Few would be those who would shed a tear over the subsequent ‘Hollande-Bashing’. The two publications rendered him un-re-electable, a fact which the Head of State took a long time to recognise. Hamon: Green Party Campaign, Green Party Score. Benoît Hamon’s victory in the Socialist ‘Primary’ momentarily gave a ray of hope for the party. His Pour la Génération Qui Vient (2017) promised to free the land from the “liberal nightmare” a “democratic awakening”, Citizens’ Initiatives, a human centred approach to the technological revolution, and apart from green policies, he advocated Universal Basic Income. Why then did the Socialists lose so badly? The ex-General Secretary is harsh on Presidential candidate Hamon. He accuses him of waging a “solitary” campaign, unable to bring together people outside of his circle, not even talking about the world of work – that is appealing to trade union support. The winner of the PS Primary snubbed his own party. He accuses Hamon of wanting to be the leader of an alternative alliance of the left of the Socialists with the Greens and acting accordingly. (P 110) He allowed Mélenchon, with whom he claimed to have few disagreements, to appear, as polls began to show that La France insoumise was ahead, to be the most useful to vote for. He was simply not Presidential, and….he spurned Cambadélis’ own construction, la Belle Alliance Populaire (a grouping of tiny ‘progressive parties’ behind the PS)…. Cambadélis makes a strong case when he argues, from electoral arithmetic, that the French left will not win power back from Macron without unity, or some kind of alliance. This holds however narrow the President’s political support is (as indicated by the massive abstention rates). Or that strategy of confronting important social layers in the interests of flexible business and ‘modernisation’ is likely to bring about deep conflict. It does not matter that his ‘party’ is virtual’ or his cadres from the upper scale on the class structure. To win you, to build an alternative majority, the left cannot wait for Macron to fail. It is through unity, the capacity to work together, that left parties with democratic structures (he recommends his own…) should work towards. Is this probable? Mélenchon, the “orator” the Chavez of Saint-Germain, can laugh at the “coffin” of the defeated PS but, “En brisant volontairement et unilatéralement l’unité des forces de gauche pour prétendre au monopole du peuple, il rend la reconquête impossible”(Page 17) In deliberately and voluntarily breaking the unity of the forces of the left, and claiming to have a monopoly of the People, he has made the Reconquest impossible. Jean-Luc Mélenchon and Le Parti communiste français (PCF), Skirmishes Continue. The traditional Fête de L’Humam a vast popular event, 550, 000 strong, organised around the left daily l‘Humanité, was by all accounts a great success. But politics did not stop for the music and gastronomy. Amongst the debates that took place the disputes between the Parti communiste français (PCF) and La France insoumise (LFI), which claims to be leading opposition to the government of Emmanuel Macron. Pierre Laurent, the national secretary of the PCF, made a number of critical comments in the direction of Jean-Luc Mélenchon, the leader of La France insoumise. He referred to the simplistic slogans of “« les sirènes dégagistes” , the sirens of “get out”!, away with the old guard, launched by Emmanuel Macron, Marine Le Pen and Jean-Luc Mélenchon during the Presidential elections. Laurent defended his party’s decision to vote against Le Pen in the second round of the contest, in contrast to Mélenchon who refused to back the ‘republican front’ against the far-right. Mélenchon was not present, he is on tour offering his opinions to the French colonial citizens of Martinique. But some of his supporters, including the Deputy Eduard Coquerel, were displeased at any criticism of their Leader. Coquerel called Laurent’s speech “violent and contemptuous” and that he and his friends had not come to the Fete with this spirit in their hearts. A further report on Laurent’s criticisms of Mélenchon’s ‘solitary strategy’ here: La guerre des étoiles à la fête de l’Huma (Libération). In this interview Corcuff states that Mélenchon’s rally uses the theorists of radical ‘left populism’, Ernesto Laclau and Chantal Mouffe as a source of “légitimité intellectuelle” to back up his claim to be the “leader” in the construction of the “People”. Classical Marxism rested on the basis of challenging people’s frustrations into a project of ending exploitation through positive measures. LFI he notes, faces two major pitfalls, moblising resentment against the “oligarchy” around the dead end of conspiracy politics “conspirationnisme” or devoting themselves to an electoral ‘reformist’ strategy which is not designed, or capable, of transforming society in depth. Amongst the 500,000 people who have clicked on the Internet and joined LFI (for free, I am, incidentally, a ‘member’), there are many different kinds of people, although, Corcuff notes, there is little sign of any significant “popular”, that is working class and poor, voice in their campaigns. There remains some hope, Corcuff concludes, amongst the capacity of local groups, independent of the leadership, who may through their own initiatives create something. But over the last 20 years, starting with the experience of the Nouveau Parti anticapitaliste (NPA), new movements on the French left have not lasted. and we will see what happens with LFI. Jean-Luc Mélenchon, as his own EU Fraud Scandal unrolls, Defends French honour in Vel’ d’Hiv’ roundup of Jews. France’s charismatic far-left leader Melenchon embroiled in EU fraud scandal. France 24. An investigation into alleged misuse of European parliamentary funds by members of a number of French political parties has been extended to include far-left leader Jean-Luc Melenchon, a judicial source said on Tuesday. The preliminary investigation – already targeting members of France‘s centrist MoDem party, conservative party The Republicans and the Socialist Party – was opened after a member of Marine Le Pen‘s far-right National Front asked the Paris prosecutor to look into the issue. Le Pen is herself under formal investigation for breach of trust in a separate case on the same subject. According to Le Parisien daily newspaper, three people who were Melenchon‘s parliamentary aides while he was a member of the European Parliament from 2009 to 2017, are to be investigated. Being a target of a preliminary investigation or a formal investigation in France does not necessarily lead to a trial. Melenchon, now a member of the French parliament, leader of the France Unbowed party and a vocal opponent of the government of centrist Emmanuel Macron, denied any misconduct in a weekly briefing on Tuesday afternoon. In a Blog post titled Jupiter déraille Jean-Luc Mélenchon offers his own take on the important questions of the day. Mélenchon’s real beef is that Macron accepted French responsibility for the round-up of French Jews at the Vel’ d’Hiv’. “dire que la France, en tant que peuple, en tant que nation est responsable de ce crime c’est admettre une définition essentialiste de notre pays totalement inacceptable.” To say it was France, as a people, as a Nation, was responsible for the crime, is completely unacceptable. No it was not France, but Vichy. For those who are surprised this is the standard Gaullist argument. What is perhaps more objectionable is the effort to outdo Charles Péguy in lyrical eulogy and a wrathful defence of France. We should all remember the words of the leader of La France insoumise. That one should speak of such things with the concern and with the love that we owe to our country above all others. More than a Thousand Activists rally in Paris for La France Insoumise as it launches its own Struggle against Macron’s Labour Reforms. Over a Thousand Rally in Paris for La France insoumise against Macron’s labour reforms. Plus d’un millier de militants ont répondu à l’appel de La France insoumise, pour exprimer leur rejet du projet de réforme du Code du travail. Jean-Luc Mélenchon a défendu une opposition frontale au texte et annoncé le lancement d’une campagne pendant l’été. 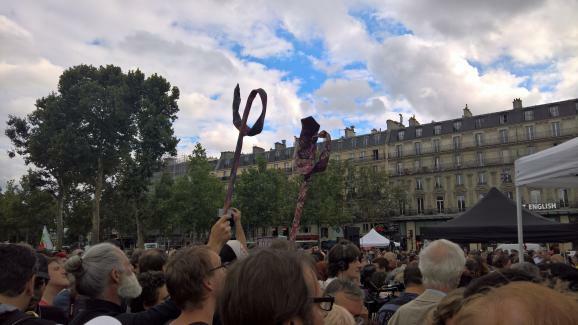 More than a thousand activists responded to France insoumise’s call to reject the project of a reform of the Code du travail. Jean-Luc Mélenchon defended frontal opposition to the text and announced the launching of a campaign during the summer. Between 300 and 1000 people in Toulouse, 300in Montpellier, 200 in Lille, around 60 Strasbourg responded to the call by Las France Insoumise. La France insoumise (FI) claims to be the principal force of opposition to the Macron government and its liberalising measures. These actions were organised by FI and it alone. Critics allege that the FI strategy of “replacement” the rest of the left, now extended to replacing trade unions, which led the movement against the Hollande/Valls El Khomri reform of the same code du travail, is against the grain of the tradition of left and labour movement unity. Meanwhile in the National Assembly the debate over the law reform remains heated: Les députés ont poursuivi mercredi l’examen de la réforme du Code du travail avec de vifs débats sur les indemnités prud’homales et le CDI de chantier. La France Insoumise reste à l’offensive.